April is Month of the Military Child; agents are encouraged to celebrate the military children in their community. Military children face unique challenges including frequent relocations. April is the month designated each year as the Month of the Military Child. Started in 1986 by former Defense Secretary Caspar Weinberger, the commemoration celebrates the important role military kids play within their community. It’s a time to recognize the unique sacrifices and challenges they face on a daily basis. Military children are strong, resilient and deserving of recognition. Communities are encouraged to plan special events and celebrations throughout the month of April and to “Purple Up! for military kids” by wearing purple on Friday, April 21, 2017. Make purple T-shirts announcing Month of the Military Child and include your brokerage information on them. Decorate your office with purple flyers, ribbons and balloons. Volunteer at a local school to read books for military children or hold a story time at your office. I’ve found a few reading suggestions here, but also check with the school and your local library for suggestions on books for each age group. Host a “Kids Open House” at a local park and provide purple treats or military themed activities. You can recognize military kids and meet parents who may be in the market for a home nearby. 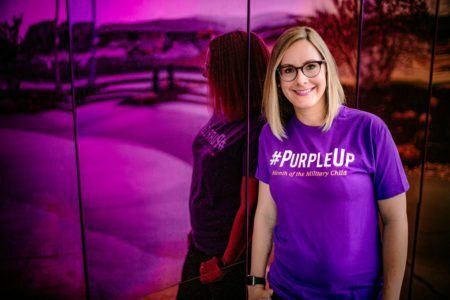 #PurpleUp on April 21st to Celebrate Month of the Military Child. Don’t limit yourself to these ideas, get creative! Please share pictures and stories of how you are showing your appreciation throughout the month. One of the unique challenges military children face are frequent relocations that come with a parent being on active duty. According to Department of Defense Education Activity (DoDEA), the average military child will move six to nine times during a school career. That’s three times more frequently than non-military families. “For most military children, this is not their first change of station, school and new set of friends. If an agent acknowledges these factors, it helps the child better embrace the move,” according to James A. Roy, the 16th Chief Master Sergeant of the Air Force. As a real estate agent you have an opportunity to celebrate and recognize military children in your community by taking part in the month-long celebration. But don’t stop on April 30th. Find ways you can welcome military kids into your community throughout the year.